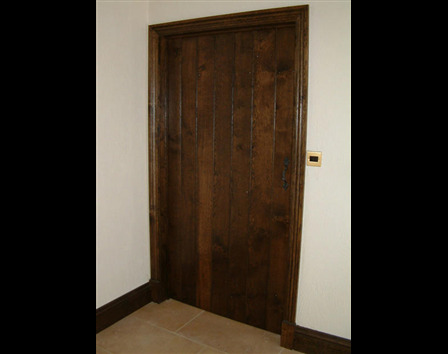 Our Classic Internal Oak Plank Doors can be made in any size up to 915mm x 2050mm in a choice of Cottage or Elegance Oak. Larger sizes can normally be accommodated subject to a supplement. If you have a slanted opening, your plank door can be cut to template in our workshops and we can also make cupboard doors in this style. The Cottage Oak plank door is more rustic in style with large and small knots and richer colour variation. The Elegance Oak door is cleaner looking, with small knots, ideal for a more contemporary country feel. All of our Classic Oak Plank Doors are made to measure in our workshops in Wales and will typically feature 4-6 planks. They have 3 ledges on the rear and are finished with decorative rosehead nails (which can be omitted for a simpler look if preferred). Unlike many oak plank doors, ours our supplied filled where necessary and sanded ready to hang. We recommend they are finished with our own Broadleaf Hardwax Oil which is available in a choice of natural, hardwearing shades, easy to apply and quick drying. Alternatively you can order your door to be finished in our workshops with one of our internal door finishes. To hang your door we recommend our traditional handforged ironmongery.